My name is Dimples. I’m a darling little bunny girl about 4 months old. I’ve had my surgery so I’m ready to be your indoor companion rabbit. I like to play with my friends, hop and dance around, and explore my surroundings for new bunny toys. Snuggles is my mother. She loves me very much so I’m living with her now. I’m weaned though and eating hay and dark leafy greens on my own. I could be your bunny dream come true I’m so sweet. Come meet me and let me hop into your life! Mon-Fri Sat 10-6 Sun 12-5. 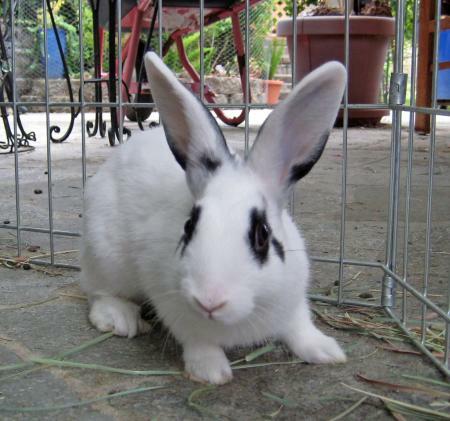 10/2008 - Update - I've been adopted into my forever home with a pretty young girl bunny named Mimi. She's my new pal. We live in Southern California with our new family. Yeah! Thanks SaveABunny for posting me on your website to get me a new fovever family and friend.